Amy Walsh Fitness: Clearcreek Fitness Bootcamp Registration is NOW OPEN! Clearcreek Fitness Bootcamp Registration is NOW OPEN! 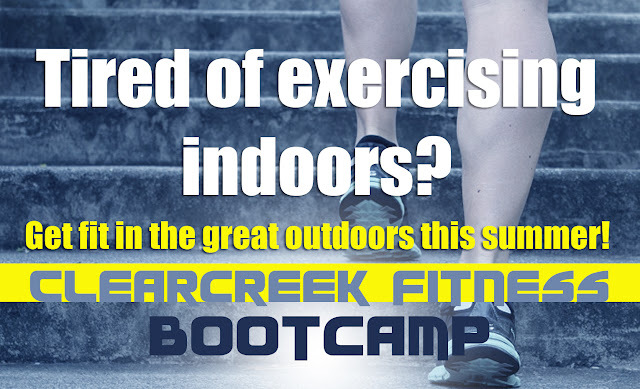 Clearcreek Fitness Bootcamp is a dynamic, fun and energizing outdoor group fitness experience. Whether you are bored with your regular workout routine, trying to lose weight for health reasons or just want to feel more comfortable in your own skin, this bootcamp is for people of all shapes, sizes and athletic capabilities. With an affordable price, early morning and evening times offered, nutrition tips and an enthusiastic and motivational certified fitness instructor, there are no excuses to not get and stay fit this summer! Register today because spaces will fill up fast! Equipment: Participants will be required to bring their own equipment. Each session will require minimal equipment. April 29 - May 24 Equipment Requirements: Exercise (or yoga) mat, jump rope and two medium weight dumbbells (8-20lbs, depending on your fitness level). Cost: $10 per class drop in fee OR $5 per class if you sign up for one full session at a time (12 classes = $60 total). That's a 50% or $60 savings! Registration: Registration is available online. Cash only for drop-ins. Waivers: Participants must read, sign and turn in all waivers before or by the first class.